There's no reason you can't be glamorous or stylish at festivals and our range of women's festival gear is proof of that! We've got a great choice of women's festival wellies in various styles to keep your feet dry and stylish in a downpour, as well as rain ponchos in different colours and patterns, so you can keep dry from head to toe. The main issue plaguing many female festival goers comes in the form of those dreaded festival toilets, so we've also got a range of portable urinals for women, so you can avoid sitting on unpleasant festival toilet seats! A quick drying towel in pink, made from lightweight microfibre material! 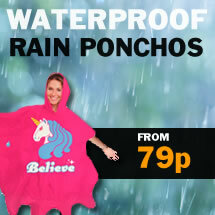 Hot pink poncho with a magical unicorn design!